Full disclosure: This one was a complete accident. I really ran out of protein bars. That almost never happens. I panicked. No im not addicted or anything, they’re just really really convenient when you have a 6 year old and have a jam packed day ahead of you. Also after all that boxing, the muscles do need a great deal of nourishment. 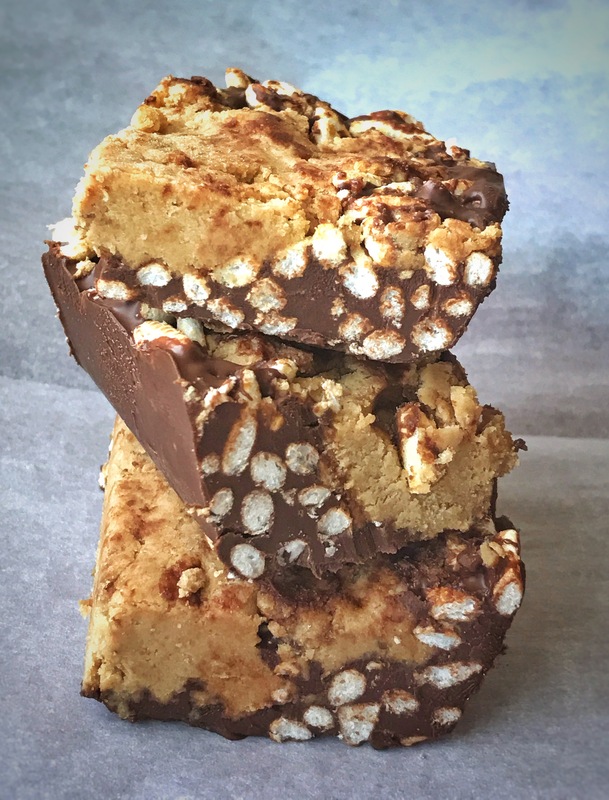 So I ransacked my pantry (don’t laugh, I do have a shelf we call pantry, perks of living in Manhattan) and put together a jumbled up batch of mushy, crunchy, chocolatey goodness with nothing but the best ingredients I could lay my hands on. My body after all! Note 1: Since I did a lot of mixing haphazardly, feel free to add or subtract some ingredients if you think the final consistency seems off. Add in the coconut oil and stir thoroughly. Pour this in the prepared tin and spread out in an even layer with a spatula. Spread the brown rice evenly on top and gently pat them down using the back of a spoon, so they get embedded in the chocolate without crushing them. In a separate bowl, mix in the almond meal, protein powder & honey and gradually add the milk of your choice till you get a slightly dry dough like consistency. NOT BATTER . Don’t dump in the entire milk contents unless u need it. Once you get a dry dough, spread it out on top of the rice and chocolate. Press it down to cover the entire surface evenly. Chill in the refrigerator for about half an hour. Once it’s hardened, transfer it (tugging gently with the parchment) onto a cutting board. Cut in squares, and store in an airtight container in the refrigerator. Don’t forget to thank me!! Previous Post It’s All about that Base!